Ending childhood cancer. Finding cures. Saving children. St. Jude Children's Research Hospital has a lofty mission for pediatric cancer, but one that Zeta Phi Beta Sorority, Inc. (ZPB) passionately supports. The sorority has partnered with St. Jude since 2013 to raise funds and awareness about pediatric cancers and diseases. Kenya Washington, ZPB’s national director of St. Jude, recounts her personal experiences with St. Jude’s approach, having witnessed her godbrother receive treatment at the hospital. She remembers him being a little kid – 3 to 6 years old – at the time. The hospital, located in Memphis, Tennessee, is one of the world’s premiere pediatric cancer research centers. Washington encourages anybody visiting Memphis to visit St. Jude and let staff give a tour to see for themselves. Children get around in red wagons, a much more fun mode of transportation than wheel chairs. “They do everything they can to make it not feel like a hospital,” Washington said. ZPB’s youth affiliates helped provide additional red wagon gifts in 2017. The year after, they gifted a surplus of medical teaching dolls. Doctors use the dolls to explain to patients the treatments or procedures they’ll be receiving. In 2019, youth donations will provide IV tubing sets, which are undoubtedly not as fun as the previous years’ gifts, but absolutely necessary, lifesaving equipment. The sorority’s ideals are heavily centered on community service as well as scholarship as sisterhood. Washington, who has been a member since 2007, says that mentoring programs, STEM projects (science, technology, engineering, and math), and ACT workshops are a few of the benefits that ZPB’s youth membership provides to girls ranging from ages under 9 through high school-aged young ladies. 1 out of 365 African-American children born in the U.S. has sickle cell disease. 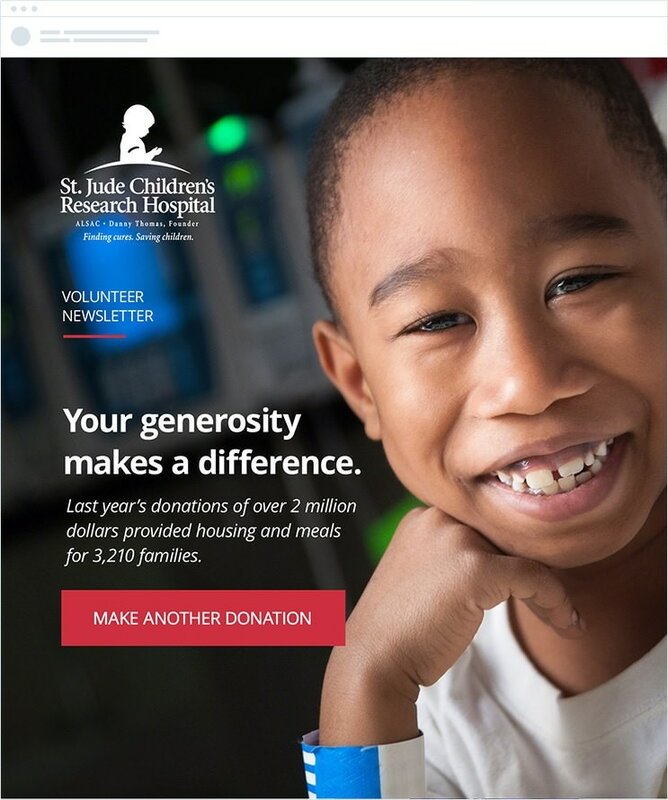 More broadly, donations support pediatric cancer research, and treatments invented at St. Jude have helped push the overall childhood cancer survival rate from 20% to more than 80% since it opened more than 50 years ago. Its goal is 100% survival, so there’s still more work to be done. Washington says that every year since she’s been working with the St. Jude campaign, her desire has been to exceed the campaign goal. In 2017, they exceeded the goal by 50%, and in 2018, by 30%. ZPB’s members have raised more than $100,000 in online donations since 2017 alone. The goal for the 2019 campaign is to raise $50,000 by June 30. ZPB has strived to make it as easy as possible to promote the campaign and for donors to give through multiple payment options. Donate online: Visit https://www.memberplanet.com/campaign/zphibhq/stjude2019 to give via credit card, bank payment, or other payment options. Text to Give: Text “donate” to (202) 846-2431 to receive a link to the Zeta-sponsored St. Jude donation campaign on any device. Cash: ZPB members who wish to donate cash can contact their local chapter to submit funds. Chapter leaders will record and report the donation to headquarters. Supporters can promote and help spread the word by creating their own personal donation site from the main donation page or sharing the campaign on social media with the hashtag #ZetasHope4StJude. ​Zeta Phi Beta Sorority, Inc. utilizes memberplanet to further its mission, fundraising initiatives, and collect payments electronically. For more information about Zeta Phi Beta, please visit http://zphib1920.org. Briana uses her passion and experience in working with foundations, nonprofits, and organizations in pursuit of academic excellence. During her free time, Briana participates as an active member of Zeta Phi Beta Sorority, and loves to dance. For the association industry, we can steal a page from Amazon’s playbook – while the membership model is nothing new, the way your association approaches the membership experience constantly needs to be kept top of mind. It really is all about the member experience. Amazon and other service giants, such as Netflix, have learned to cater exclusively to their members through complex algorithms – gone is the “one size fits all” mantra. Woven into the member experience is value. Membership-based organizations need to remember their value proposition, and they must deliver on it. Try not to get too wrapped up in dues payments and donations. Focus on the value your association can offer your members. Convenience is also key. Your association may drive value, provide the best and most comprehensive solutions and benefits – but are they easy to access? Are your members spending too much time on painstaking tasks that provide no value to them? Do your members have a clear picture of the benefits you provide? Amazon and Netflix have seen sustained success not only because of their innovation, but because their services are easy and fast to utilize. Customers know exactly the benefits of being a member, and it’s easy to access those benefits and manage their own accounts at a time when it’s most convenient for them. Something that we must also consider – which is outside the scope of Amazon and Netflix services – is the impact your association has on constituents. More often than not, the value of an association goes beyond transactional services. Associations provide education, advocacy, community, and more to their members – but it doesn’t stop there. Those members in turn provide value to their industries, constituents, and societies to which they belong. If you want your association to experience longevity, embrace your role in providing value that goes beyond membership. Cassie brings more than a decade of experience to her role in helping chapter-based organizations, professional, and trade associations succeed. She is a driving force at memberplanet who is constantly questioning the status quo to bring fresh ideas and dynamic solutions to the table. Contrary to popular belief, you really don’t need a big budget or a celebrity cameo to successfully market your event. Save the big bucks for other areas of your event planning and hosting – you can still effectively get the word out with an impeccable, multi-channel marketing strategy. Read on for suggestions on how to ensure your next big event is well promoted and attended. Reach out to your social networks on LinkedIn, Facebook, Twitter, and Instagram with engaging content. Create posts that will create an emotional connection with your audience. Now’s the time to be bold, exciting, and buzzworthy. This is where quotes from your speaker interviews and videos can be repurposed. If you don’t have a graphic designer, Canva is an easy and free tool to use to put together digital posters and flyers. A social media scheduler like Buffer can also help you plan posts in advance. Another way to elicit engagement is to post polls and surveys pre- and post-event. You can get feedback on venue suggestions, what type of upcoming events your followers are looking forward to, and awards-related topics – nominations, recognition, and prizes. Additional tip: When you publish your posts, don’t forget to use appropriate hashtags and actively like, comment, and share others’ posts. Doing this helps boost your own posts’ visibility! Take advantage of paid promotion on social media. Running a pay-per-click ad on Facebook or LinkedIn is an affordable way to reach your target audience, and you only pay when users take action. Before doing this, set up an event landing page where visitors can find out all about your event and purchase tickets. Aside from social media, don’t disregard creating paper flyers to distribute in your community as well as traditional advertising with your local radio, TV stations, and newspapers. If buying an ad isn’t an option, send a press release with details on how your event can be covered with a free press pass or two to your event. 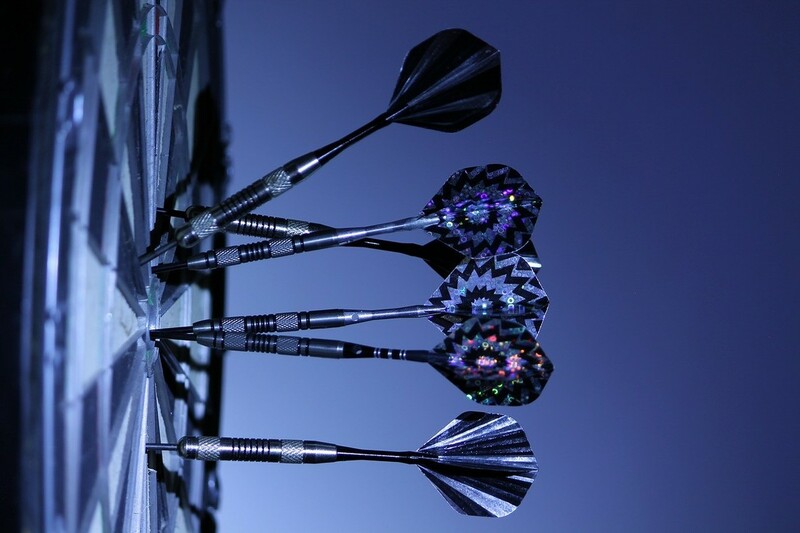 Email marketing is still one of the most efficient and cost-effective channels to reach a target audience. If you have an email newsletter, give your upcoming event prime placement. Or, set up a separate email campaign solely dedicated to sending event invites. Craft attention-grabbing subject lines, and keep an eye on email stats such as opens and clicks so you can further optimize each email. Most email marketing systems provide these standard metrics so you can track what’s working and what isn’t. Pro Tip: Email event reminders and invites three times (on different days of course). The average office worker receives 121 emails every day. Because emails are so disposable and we’re all easily distracted due to multitasking, everyone needs multiple reminders. Sending text messages is by far the most effective means of communication. According to Forbes, 95 percent of all texts are read within three minutes. If you want to make sure your members are aware of your event, text them. Keep in mind that SMS marketing is heavily regulated to protect consumers and marketers alike (users can opt out). Use common sense, send messages when appropriate, and don’t sound spammy. Marketing is just one component of orchestrating a successful event. The right tools can help you effortlessly plan, promote, and manage an event for your association. Our online membership platform is fully integrated with event management, communication, and social media tools and features, so tracking member activity, participation, and financials can be done in one place. Streamline online event management and let your staff and volunteers spend more time on your mission – contact memberplanet to learn more about how we can help you manage, engage, and grow. ​Updated since original publication on 1/19/18. You'll be hard-pressed to find anyone who's as hardworking and dedicated to client success as our Director of Business Development. 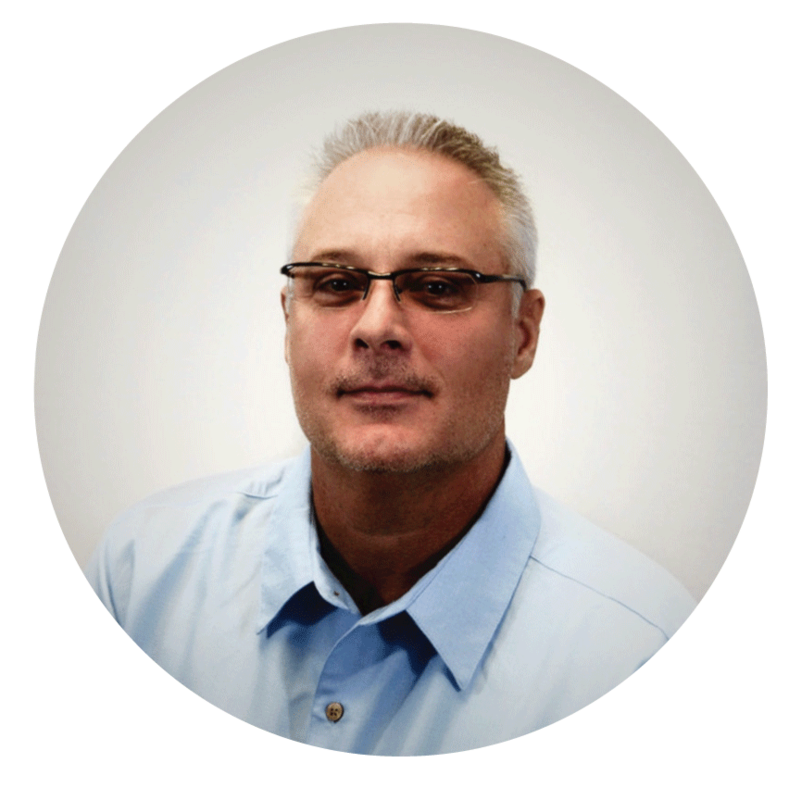 Patrick's determination, entrepreneurial spirit, and diehard Michigan Wolverines loyalty make him one of the best membership experts in the industry. LinkedIn and Facebook are two of the most useful networks for expanding your reach. Both social media channels allow you to create your own page to promote your association and maintain constant contact with your members, followers, and viewers. Update your members with upcoming meetings and events while keeping them engaged with polls and surveys to collect feedback. Being present on these platforms also helps potential members preview membership, understand your association’s mission, and see the kind of work you’re doing. Host an event where each current member invites a non-member. During the event, encourage these non-members to join by offering a discount only during that time. Hosting events for both current and potential members is a great way to get everyone involved in the recruiting process. To attract those who had been considering membership but either were not ready to commit or were deterred by the fees, waive application fees for a limited time. Or offer additional perks with an expiration date. Advertise and announce the offer in your newsletter and on social media so prospects become aware they’re getting a great deal. When you convey a sense of urgency (Act fast to take advantage of waived membership fees! ), your potential members will see more value in joining during this time. You’ll additionally want to make sure your membership benefits are competitive with other associations’, so as not to deter those who are comparing. 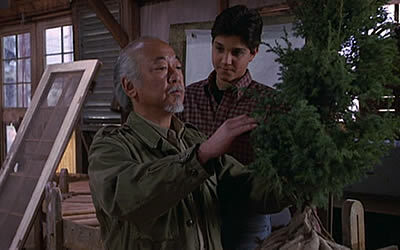 If it can’t be measured, it can’t be managed. Record metrics of your engagement efforts to gauge your success and find ways to optimize over time. Some things to keep an eye on are email and text message metrics, such as open and clickthrough rates, as well as resulting membership numbers, i.e. renewals and new signups. Most marketing and membership software offer standard tracking, but it can be a difficult and time-consuming task to tie your data together if you’re not using the right tools. Our engagement solutions are fully integrated with a full suite of membership, communication, and event management tools on the memberplanet platform. You and your staff gain actionable insights with real-time reporting and a centralized database of membership for both your members and potential members. Maximize your engagement efforts and get a high-level view your association’s health – contact memberplanet to learn more about how we can help you manage, engage, and grow. Updated since original publication on 2/20/18. Facebook and Instagram polls are great for social engagement, but don’t quite cut it for official voting functions. 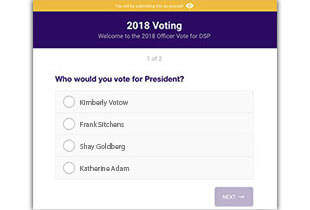 Our new polls tool is useful to all organizations by allowing them to facilitate secure, professional voting for officer elections, awards, or other ballot and election-oriented tasks. We offer much more customization and useful features – such as the ability to include more than one question – than polls on social media. Administrators have the flexibility to customize who is qualified to take a poll, start and end times to access the poll, as well as the data displayed in real-time results. 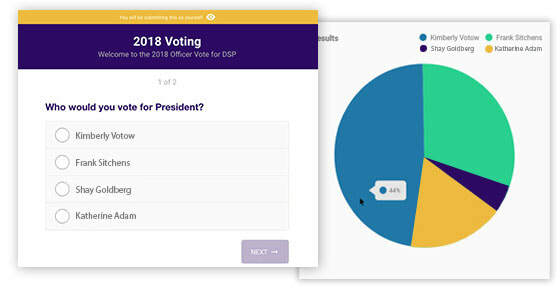 Note: If you are on an Enterprise plan, or belong to a chapter or club whose national or headquarters level has a partnership with memberplanet, you will have access to the polls feature. ​To get started, log in to memberplanet and follow the steps below to create, share, and view results for a poll. Intro: You can provide information about the poll before members take it. Thank You: Include a customized thank-you message when members complete the poll. Closed Poll: Provide a specific message for members attempting to take the poll after it has closed. Footer: Include any messaging that will appear at the bottom of the poll. Add Manually: Enter the name and email addresses for those you want to share the poll with. Choose From Group: Share the poll with either all your members, your group's contacts, or both. Choose From List: Select members individually from your roster to share the poll with. Admins can view poll results in real time without the hassle of waiting for tabulation. The data is presented both as a list of individual responses and as a pie chart for better graphical interpretation of the data. There is also additional polls functionality that allows them to be paused or deleted, and poll results can easily be exported as an Excel file. View the full polls documentation in our Support Center. If you would like to take advantage of this feature on our Enterprise plan, please schedule a chat with me. Member participation is a keen indicator of an organization’s overall health. 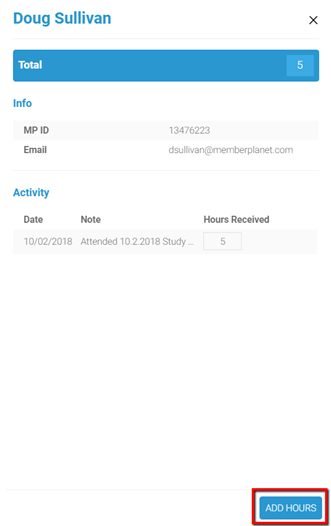 The memberplanet participation tracker provides administrators a transparent and accountable way to record or award credit (or points, hours, or any other type of format) to members for their involvement in your activities, such as attending an event, completing study hours, or volunteering their time. This is an excellent tool to recognize and reward active members, monitor overall event attendance or track volunteer hours, and learn which activities are actively engaging your members. From a reporting perspective, there’s no need to keep clipboards or spreadsheets on file to log member participation. Your tracker data is securely recorded and tracked by date and time in a customizable reporting format. You’ll be able to see who received credits and which admin awarded participation, as well as make any edits without navigating away from the report. Participation tracker is available to organizations on an Enterprise plan. Get started by logging in to memberplanet and following the steps below to create, add member participation, and view the data in a tracker. Admins easily get up and running by creating a tracker from our pre-set templates to track hours or points, but for full customization, these steps allow you create a tracker from scratch. You can choose to track anything - whatever you type in will be reflected in your tracker reports. Admins can add participation to any existing tracker. There are a few conditions to add participation: A tracker must already be created in order to add member participation to it, and the person you wish to add participation for must be a member of your organization. You will need to type in at least two characters to populate results. Admins can view the data of a particular tracker at any time. 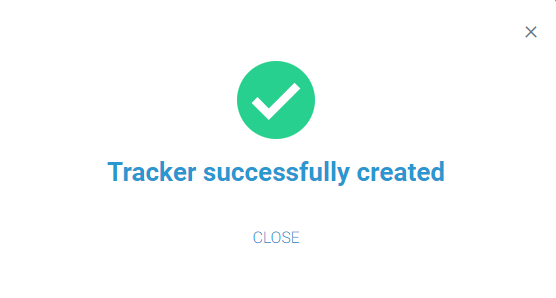 Each participation tracker includes the member’s name and group ID number, the participation value earned for that tracker, and who awarded or added the participation. View the full participation tracker documentation in our Support Center. Admins can award participation credits for event attendance by linking a participation tracker to event check-in. 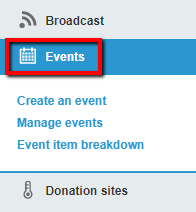 Learn more: How to Add a Participation Tracker to an Event. Gaining visibility over member participation in your organization’s activities is paramount for understanding how effective your engagement efforts are – and therefore, how successful your organization is. To learn more about how memberplanet’s Enterprise features can help your organization, please contact me. 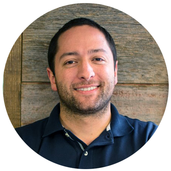 ​As our Vice President of Business Development, Matt is dedicated to serving member-based organizations and small to mid-sized associations. With over 10 years of experience wearing various leadership hats as an Alpha Tau Omega alumnus, Matt specializes in all fraternal organization matters. 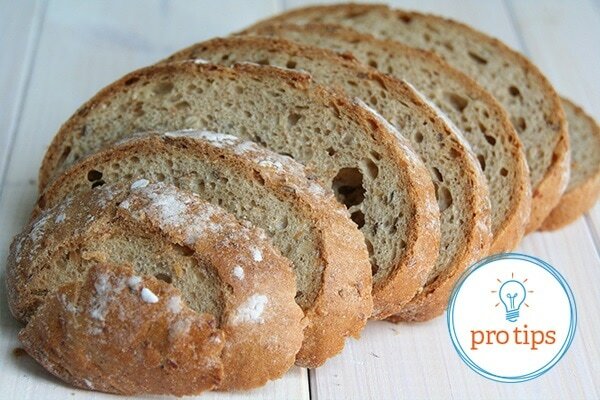 Whether a group is challenged with growing membership or engaging members, he's got a solution. Coordinating a large event, such as a conference or annual meeting, where you’ve got multiple vendors, speakers, and a lot of eager attendees is plenty to deal with. While you might get a kick out of running the show, making sure everything goes smoothly (at least from the member perspective), and crossing off items on your to-do list, accurately tracking attendance is not something you need to stress over. Our recent tech update simplifies RSVP sharing and events check-in. Enabling RSVPs has awesome benefits – you can get a headcount ahead of time, generate event buzz by letting guests see who else has RSVP’d, and send tailored messages targeting people on your guest list based on their RSVP response. It’s a great way to promote online event registration and increase operational visibility on the days leading up to your event. Previously, some guests would forward their personalized invite to a friend. When their friend RSVP’d using the link from the invite, it registered as an RSVP from the initial email recipient. You can imagine how that would create a lot of confusion on the reporting side. Our recent fix added an option to verify whether the person’s name matches the name on the invite. If it doesn’t, they can log in with their own credentials and continue to RSVP. Members who click the link will be directed to the RSVP page where they can enter their basic information and click Continue to complete their RSVP. While RSVPing lets you track attendance before your event, the new check-in feature gives you the ability to accurately track and record attendance on the actual day of your event. On a smaller scale, this is also critical if your organization requires members to be physically present for an activity, such as a community outreach, weekly membership meeting, or a study session. Admins can record a check-in by requiring members to use a system-generated passcode or manually checking in attendees. Admins can also customize the start and end times of the check-in window and edit the check-in status of a member. If you are on an Enterprise plan, or belong to a chapter or club whose national or headquarters level has a partnership with memberplanet, you can automatically award and record credits for members when they check in. Admins can do this by linking an event check-in with a participation tracker. 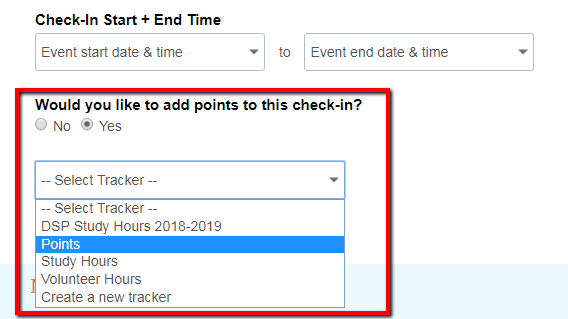 If you have the tracker feature enabled on your subscription plan, you will see an additional option below the check-in details to add points. Learn more about the Participation Tracker feature, or click to view the full support documentation for enabling events check-in. You can spend 20 minutes flipping through the pages of your address book, or you can find exactly who and what you’re looking for in 20 seconds using your interactive directory on memberplanet. Welcome to the future of networking. Our most recent launch of memberplanet includes an updated member directory that features a full library of your organization’s members, their profiles, and their personalized information. Each member’s data is only accessible by your group, and displayed information settings are controlled by individual privacy settings. Request that members showcase their education, career, member level, or group title on their profile, or alternatively allow them to maintain the mystery with as little disclosure possible (aside from required fields, of course). Networking has never been easier on memberplanet. You’re going to love this new look and feel. ​The possibilities are figuratively endless with the new interactive directory layout and settings. Individual profiles share, but are not limited to, events members are attending, public social media account links, and contact information. Set custom fields for your members to fill out so that the data populates across every profile. Don’t worry – having your members fill out their profile isn’t labor intensive. Some of the data will automatically populate based on their email address (which remains private) if it is associated with public social media accounts. But wait, there’s more – when you take advantage of the many perks of the Pro or Premium subscriptions on memberplanet, you and your members will be able to utilize advanced search features. Select the Smart Search option within the search bar to look up members by any field of information your group collects. Clicking on a member profile will show the information that user has chosen to display. Give your members networking and mentorship opportunities, foster an online community, and improve engagement. They’ll have the ability to search other members in your organization using custom field data, such as who’s attending a specific event, similar interests, or who lives in the same city. Note: If you are on an Enterprise plan, or belong to a chapter or club whose national or headquarters level has a partnership with memberplanet, your members can benefit from a more personalized experience. 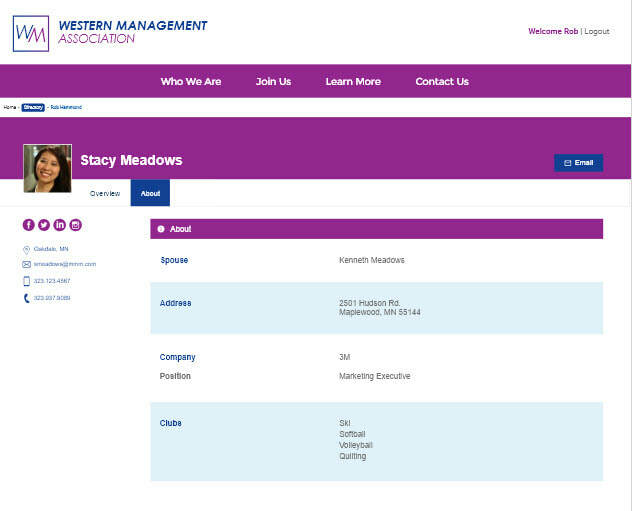 When coupled with our integrated websites, members can access the directory via secure login from your homepage. Multi-tiered organizations can allow their child groups, such as chapters, clubs, or units, to search members on a local and/or national level. You can find out how to use these features by viewing the full interactive directory support documents in our Support Center. If you would like to learn more about how our Enterprise features such as the directory can give your members a truly interactive experience, please schedule a chat with our sales team. Updated since original publication on 7/19/18. Quickly parse organization data by utilizing search options like payment amounts, partial names like a last name only, and payment source. Every field displayed is searched, so if you enter in "30" in in the search box, you can rest assured that whether it appears in the date, is part of a string in reference numbers, or is shown in any other field, it will be listed in records returned. Enter your search terms in the search box located in the upper right side of your report, then click the magnifying glass icon to return results. The report displays all your organizations transactions, and where admins have the permissions, they have convenience of issuing refunds from the same screen. Filter by payment type, and view payment details such as schedules of recurring and installment payments by simply clicking on a record. A detail screen will appear on the right-hand side. From there, an admin can view the status of payments without having to navigate away from the initial report. 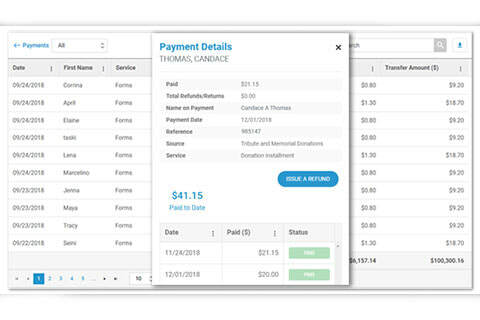 In one location, you can view complete running totals for payments, fees, and total transaction amounts for your entire organization. 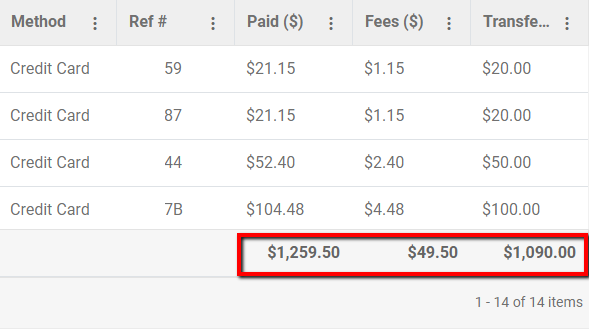 Totals for your transaction data for the date range selected (not just page totals) is located at the bottom right of your All Payments report. Date parameters default to "any time," which is the time your organization began collecting funds on memberplanet to the present, so you start off by seeing the complete transaction information for the history of your group. 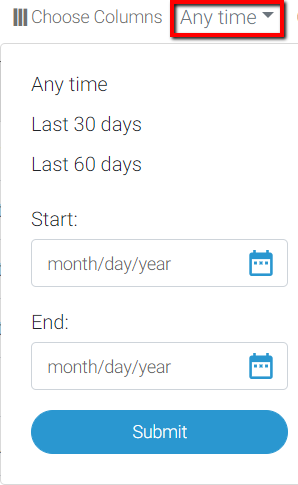 The dropdown menu allows you to modify the date range, choose from other options, such as the last 30 days, or enter a specific date range. Click on the dropdown menu labeled Any Time at the top of the report to adjust date range. 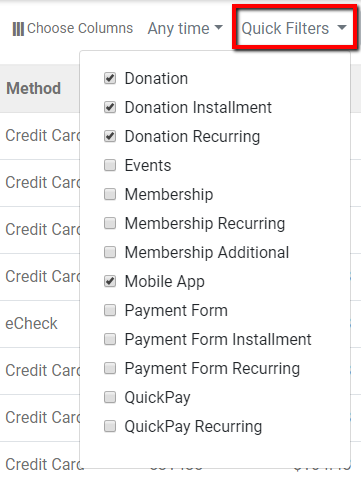 These filters provide the ability to display payment activity by type of payment (installment or recurring) or memberplanet service such as events, donations, membership, and more to give you specific transaction details by source. Click on the Quick Filters dropdown menu at the top of your report to check off any combination of filters. 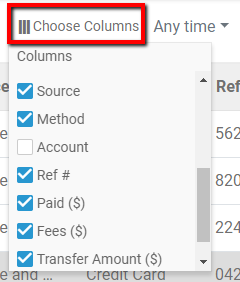 The column data of your All Payments report is also configurable so you can show and hide data fields according to your viewing preference. Drag and drop columns to customize your report layout, and set column data to sort by ascending or descending. You can also lock columns to make it easier to view data as you scroll horizontally. Click on Choose Columns along the top of the report to add or remove column data, and to lock columns. Organizations that have a child groups such as chapters, clubs, or units, can now view all data for their child groups in one consolidated report. The All Payments report default setting is Activity in My Group, which will isolate your group’s records. To view all records, including activity in your child groups, select Activity in My Organization. If you wish to view the former All Payments report, don't worry it's still available to you. Just click on the Former All Payments report link near the top of the page and you'll be directed back to it. Log in to check out the new report or visit our Support Center to view the full All Payments report documentation. Updated since original publication on 8/21/18.